A bellwether trial over the risk of bleeding injury with Xarelto (rivaroxoaban) opened in Philadelphia in early November. The trial will hear a case filed by Lynn Hartman and her spouse, alleging that Xarelto’s side effects cause Ms. Hartman to experience severe internal bleeding. 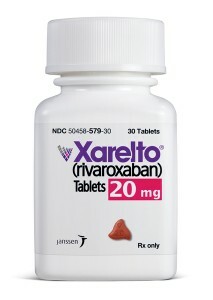 Xarelto is manufactured by Janssen, a division of Johnson & Johnson. The claim is a product liability suit against the manufacturer. The opening of the case was delayed half a day as the judge weighed concerns that a sales representation for Janssen had contacted Ms. Hartman’s physician improperly. Dr. James Aldridge, the physician, was said by plaintiffs to have agreed to testify that Ms. Hartman’s internal bleeding was due to Xarelto. However, plaintiffs now indicate that after a meeting with a Janssen sales representative several weeks before his deposition, he reversed his testimony. Now, attorneys for Ms. Hartman say, he indicates he did not know she had internal bleeding. Janssen attorneys indicate that the sales rep called the office, but did not speak with the physician in person. The trial judge is reviewing the testimony. Xarelto has been available since 2011. It was the second of a new drug class called novel oral anticoagulants. Initially, Xarelto and other drugs of the class were touted as possessing more ease of use than warfarin, the then-standard treatment. Later, however, a number of adverse events regarding severe uncontrolled bleeding were received. In addition, while an antidote to uncontrolled bleeding with warfarin is widely known and available, no antidote exists for bleeding with Xarelto and the other second-generation drugs. Product claims center around both product liability for insufficient warning to both the medical community and patients and failure to warn about the lack of antidote. Approximately 1,500 Xarelto cases are pending in Pennsylvania state court. Ms. Evans’s case is the first to go before a judge. Many more claims against Janssen, roughly 18,000, have been filed at the federal level. Three of these Xarelto lawsuits have resulted in verdicts for the defendants.